Can I be painfully honest with you? Not thank-God-he-told me honesty, where you had toilet paper stuck to your foot. No, a straight right hook to the face, brutal honesty. This is going to hurt I promise – You won’t like it, you might even get mad. I can guarantee this is the truth though, and out of respect I feel compelled to tell you. You know how you have been struggling to get customer attention? Tried everything, and it isn’t working? Hoping for that big break? It is not because your product isn’t helpful enough for your customers. It is not because you are in the wrong industry. It is not because you are lacking talent. It is because you’re not original. And if you ever want a chance in hell of someone paying attention to you— you’d better make a radical shift. Yes I said it, you are boring and unoriginal, not worthy of attention. Sorry, it is the truth. Successful businesses all have one thing you don’t: a radical differentiation. The Power of Being Different. According to The Nature Conservatory, a typical four-square-mile patch of rainforest contains as many as 1,500 flowering plants, 750 species of trees, 400 species of birds and 150 species of butterflies. In nature, being different allows for plants and animals to thrive instead of being choked out by competition. Just look at the Venus Flytrap. The Venus Flytrap adapted to consume bugs because it was not tall enough to receive constant sunlight and nutrients. It is time to adapt or die. Look, it is simple. We all want customer attention. Being different gets you that attention—and is vital for your brand strategy. Do you remember the “girl in the red dress” from the movie The Matrix? Of course you do. She was more than just a beautiful blonde in a red dress, she was different. But, a radical differentiation does more than just get attention. It allows you to set up customer expectations for what is about to happen. Keith Murnighan from the Kellogg School of Management calls this a Trust Scheme. Promise a bunch of small things and follow through. Promise something HUGE and follow through. So please, promise me something HUGE! Something Radical. Something Different from the dull monotony of my life. I don’t care about mediocrity, I want something amazing. And, guess what? Your customers want something amazing too. How Do You Know When You Have Something Radical? Simple, if the thought of your idea scares you. When others tell you it is crazy and impossible. When you feel like Bruce Lee taking on Wong Jack Man fighting for the sake of your legacy! Stand on the edge of a high cliff and you will know the feeling. A mixture of fear and excitement! Okay sounds great, but how do I do this? Simple, you become a better person and business. Has anyone else ever offered something similar to your proposed difference? Does it fit your essence? Be unique—I know what you’re thinking. Unique. Great. Like I haven’t heard that before. How can I be unique when everything has already been done before? Wait, is it even possible to be unique? The answer to all this is—relax and reflect. Your business is a reflection of you. And I’m willing to bet, you’re unique. Quite frankly, because everyone is. Nobody can be you. So, use it to your advantage! Take the time to incorporate more you into your business and express that charismatic attraction. “Remember: Your focus determines your reality.” – Qui-Gon Jinn. You’re a 12 year old kid with a magnifying glass, and the world is your ant. Focus and concentration allow you to channel all your energy into creating a laser-beam target on your desired outcome. What is vital to your customers? If your house was on fire, there are only three things that are vital to that situation. Is your family safe, do you have great insurance, and where the heck are the firemen? This might be extreme, but what is vital depends on your customers. I need a great cup of coffee in the morning to stimulate my creative mind. The local gas station’s burnt black sludge does not suffice. It is vital to me that I have a Venti Iced-coffee. You know, the Starbucks version, where they dump the old coffee every 8 minutes and spark up a new brew. Fresh is the key here. And that is vital to me. Do your customers need your service? Scratch that, is it indispensable to them? Is their life incomplete without it? STAND OUT and MAKE SOME NOISE! How about I show you some tips and exercises from industry professionals and celebrities? Here’s the chance to rock the foundation of your business and get some movement in that old framework! Before you can make something new and fresh you need to know what has been done before. Use the Strategy Canvas in W. Chan Kim and Renée Mauborgne’s book Blue Ocean Strategy to find that innovative quality in your business. Grab a sheet of paper and a pen. Draw a straight line across the page. On the X-axis, write down everything your company competes on in your industry. On the Y-axis, write the level of offering the buyer receives and therefore increases price. 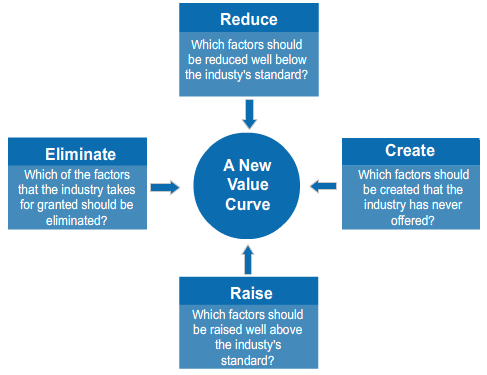 After completing the exercise you’ll find a series of curves that show the current state of your industry. Analyze the “white space.” This is the area where other companies are not competing. In the case of the graph below, it would be the very opposite of the industry standard as shown as the red lines. Use this space to discover areas for your business to shine and be innovative. 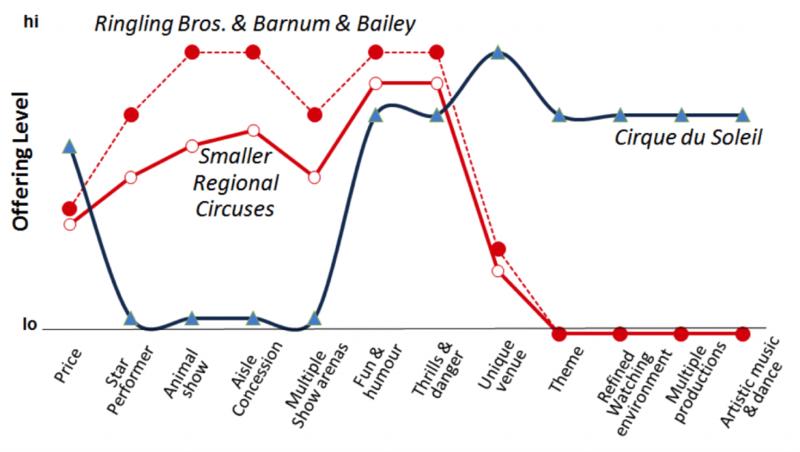 In the graph above, Cirque du Soleil sought for a radical differentiation to gain market share in the circus and entertainment industry. They first looked at what other circuses were doing. From there, they knew to do almost the opposite of Ringling Brothers in order to garner attention and fans. How does a common circus change the game? Simple! High dangerous acts, beautifully themed venues, running multiple productions every day, storytelling and a beautiful blend of music and dance artistry. A formula for—a one-of-a-kind act! Afterward, in Blue Ocean Strategy, they use a tool called the Four Action Framework to create a radical differentiation. The idea is to reduce and eliminate any factors your industry is competing on that aren’t adding value to your customer. This allows you to become priced competitively. Then raise and create other factors that have never been done in your industry before. This gives you a radical differentiation. Something that—has never been done before. Something unique, something different… something new! In the book ZAG, author, Marty Neumeier lays out his formula for a radical differentiation. He calls it an “only” statement. An “only” statement is a competitive advantage only your company can claim. The formula looks like this: (company) is the only (what you are) that (does this specific thing) in (your specific market). For Example, Starbucks is the only coffeehouse that offers a European coffee experience. Plug in your company, your industry, your specific area and your market. There you have it! An only statement. Everyone should include an only statement in their brand strategy. Guy Kawasaki’s Holy Cow Test. The “Holy Cow” test shows how remarkable the content is. In other words, how shareworthy is the content? Will your clients say “Holy Cow” when you offer your radical differentiation? Only when everyone says, YES—do you have this coveted non-physical thing that screams for attention. Find your way to STAND OUT and really command that attention! Need some inspiration? Draw on other business people and celebrities. They all stood out! Here are loads of quotes for creativity and inspiration. Building your radical differentiation is the Millennium Falcon to your Han Solo. When you figure it out, you can make the “Kessel Run in less than twelve parsecs” with your business. Remember to set effective business goals and start with small action steps today. Building a slammin’ differentiation may take some time—start with a direction and work towards it every day. To create a differentiation, start with mapping out the current environment. Your differentiation will create a Trust Scheme, which will tie directly into your brand promise and brand contract. Brand promise will be included in part three of this branding blog series.